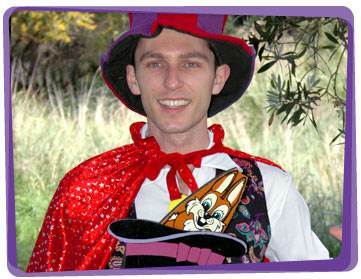 Are you looking to hire a magician for a kids birthday party in Perth? With a magical spell, let our Yabadoo magicians vanquish your cares and worries away. Our skilled magicians for hire know what makes a great party, and we have so much in store for you! 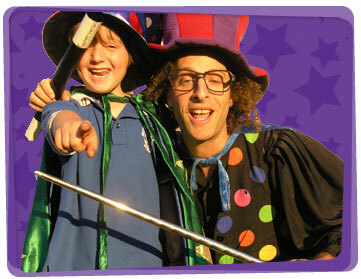 Imagine big balloon animals, crazy games, gorgeous face painting and the best magic show in the biz! To ensure your birthday child knows they’re special they will be given a special modelled balloon birthday prize during the magic show. Do you have special requirements? No problem. We have over 18 years experience entertaining different audiences in a wide variety of settings. 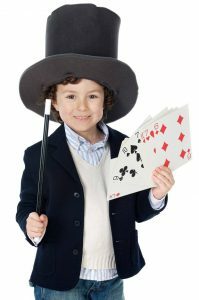 Our Magicians for hire in Perth regularly perform at events such as shopping centres, promotional events, product launches, kids birthday parties, fairs, christenings, christmas parties, corporate events, playgroups and just about any other occasion you can think of. Here is a classic magician party game idea that does not fail to put smiles on the children’s faces! Print out or draw a picture of a magician and put it up on the wall. Put a double-sided tape on a black straw to act as the wand. Blindfold the child and turn him/her around three times. When you stop, make sure he/she is facing the magician picture. The child walks towards the picture and tries to stick the wand as close as he/she can to the magician’s hands. After sticking it, the child takes off his blindfold and writes his/her name beside the wand to mark it. The child who tapes the wand closest to the magician’s hand wins! Are you looking for easy magician party decoration ideas? 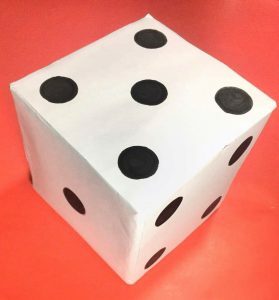 This huge dice will make your magician party seem like a magical room where things are larger than they really are! Wrap the boxes with white photocopy paper. Use something circular to use as a guide for the dots. Trace around it and use a black marker to color it in. Use small ones for table centerpieces. Make large ones for the entrance door! This looks best when you 2-3 dices and stack them up. 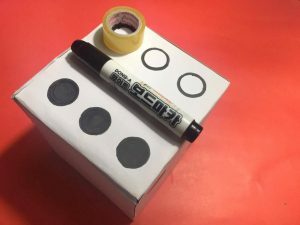 You can also interchange the colors by using white dots on black paper. Enjoy!